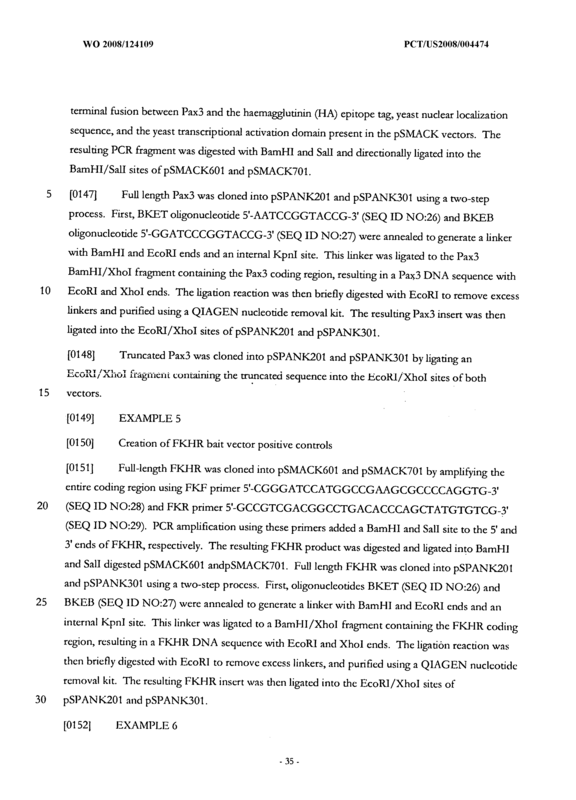 Disclosed are methods for identifying molecular interactions between DNA sequences and proteins in vivo. 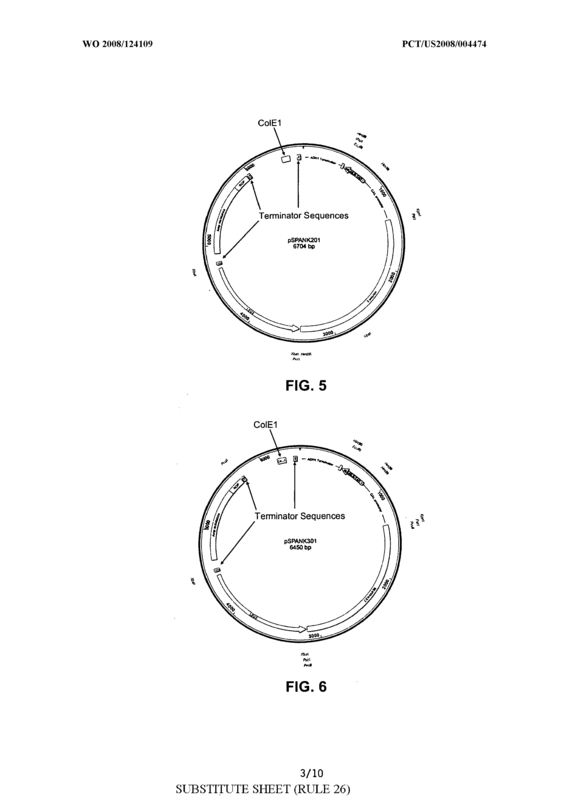 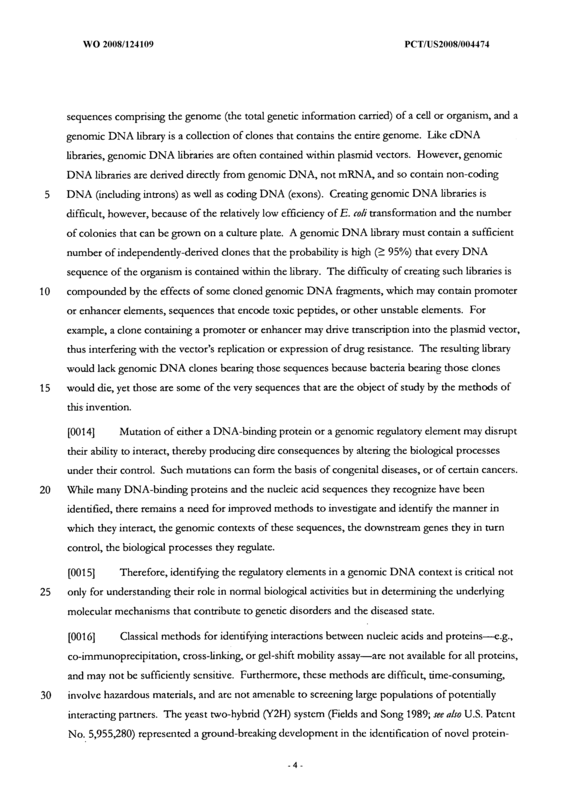 The methods of the invention employ known or suspected DNA-binding proteins and genomic DNA in a plasmid library. 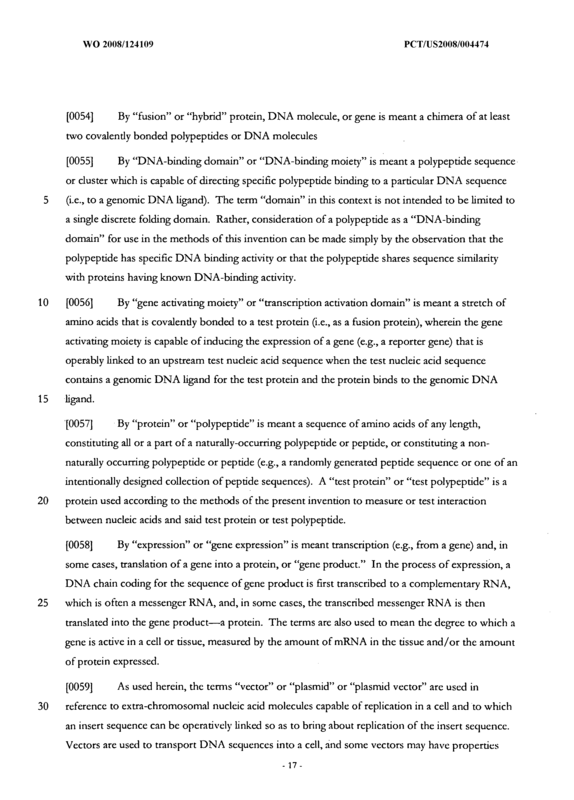 Interacting molecules direct the expression of a reporter gene, the expression of which is then assayed. 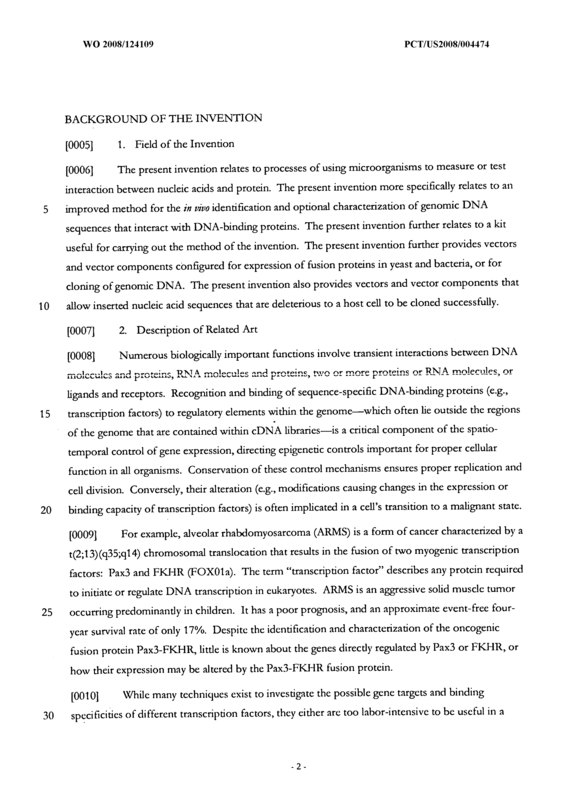 Also disclosed are genetic constructs useful in practicing the methods of the invention. 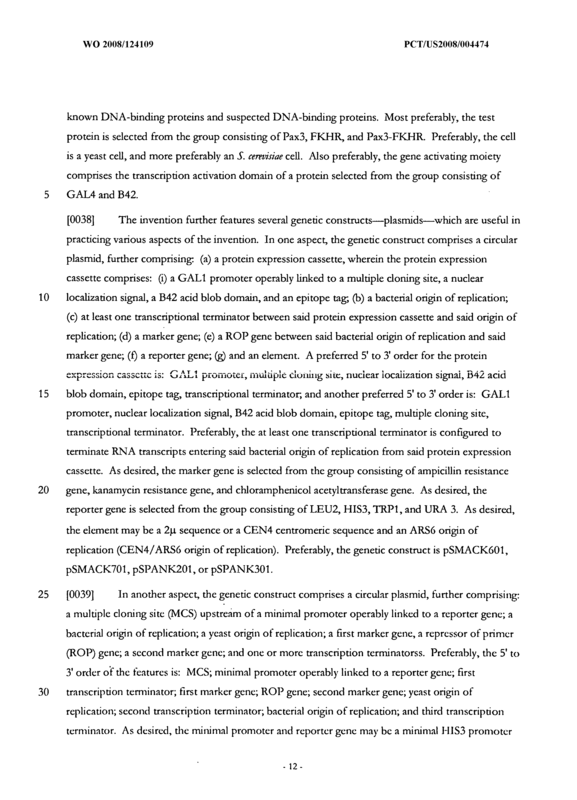 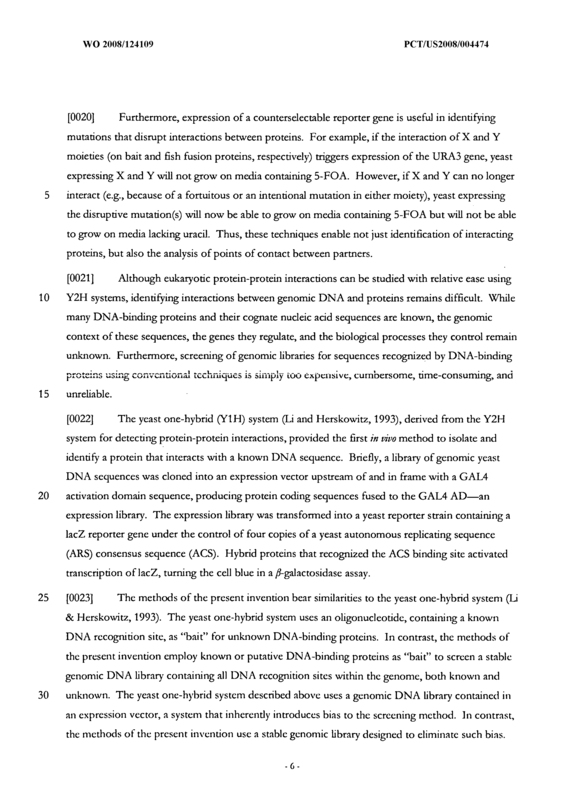 (b) detecting expression of the reporter gene as a measure of the ability of the test protein to interact with the test nucleic acid sequence, wherein the test nucleic acid sequence in the population of competent cells is derived from a genomic DNA library. 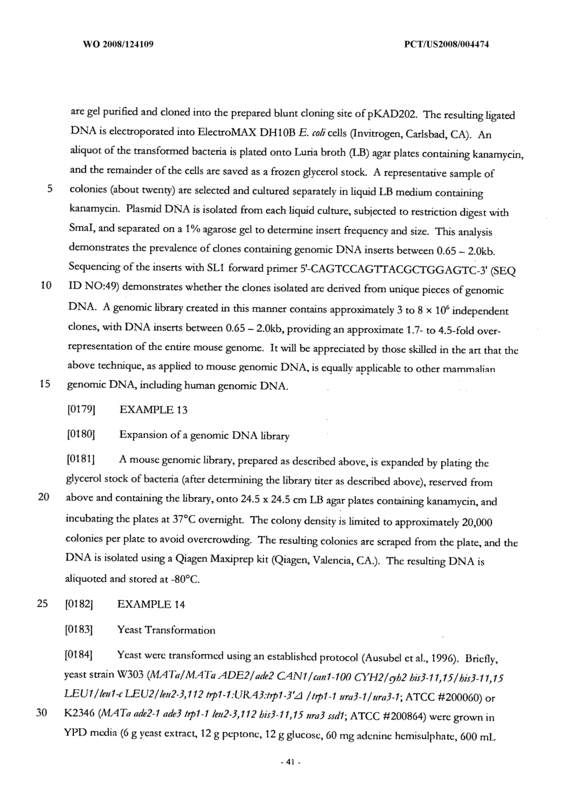 The method of claim 1 , wherein the genomic DNA library is a stable genomic DNA library. 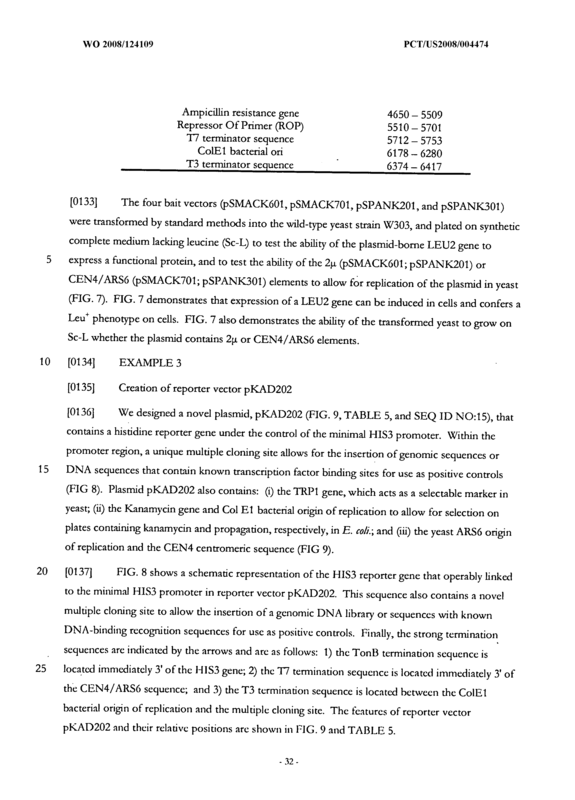 The method of claim 2, wherein the reporter gene is selected from the group consisting of selectable reporter genes, counterselectable reporter genes, and selectable/counterselectable reporter genes. 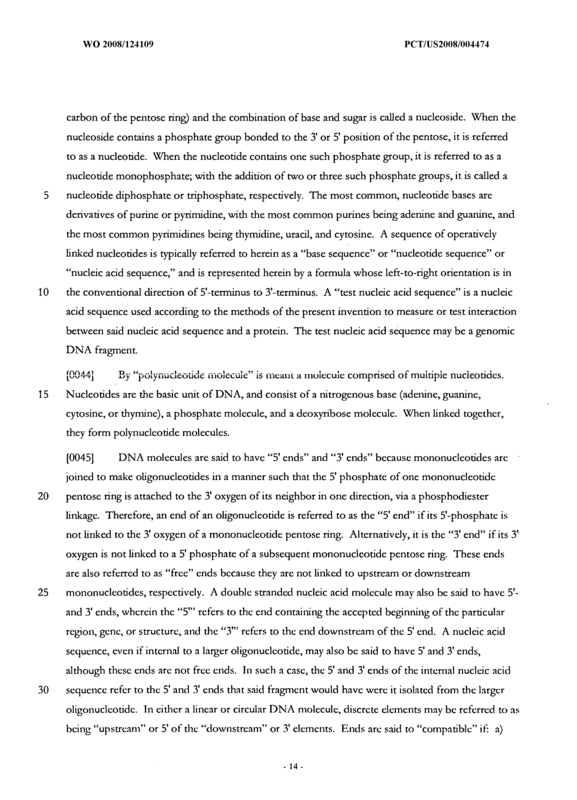 The method of claim 2, wherein the reporter gene is selected from the group consisting of amino acid biosynthetic genes, nucleic acid biosynthetic genes, and antibiotic resistance genes. 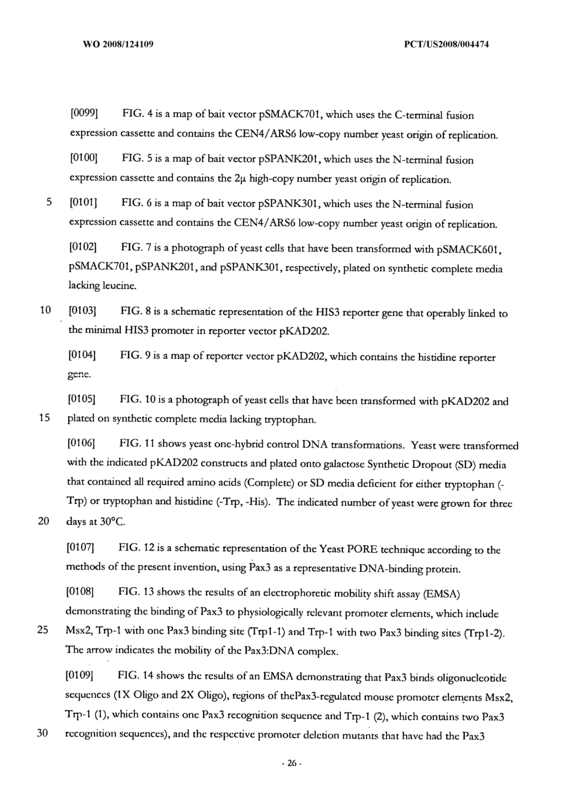 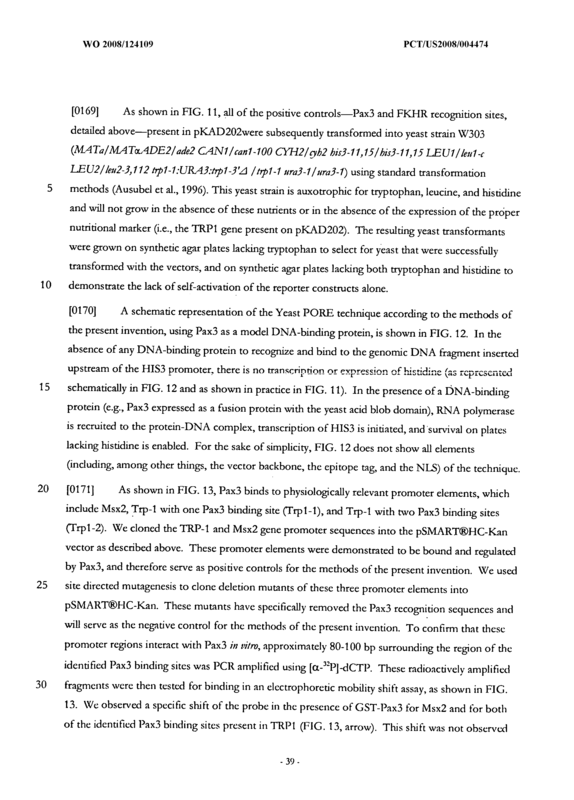 The method of claim 2, wherein the reporter gene is selected from the group consisting of LEU2, HlS3, TRPl, and URA 3. 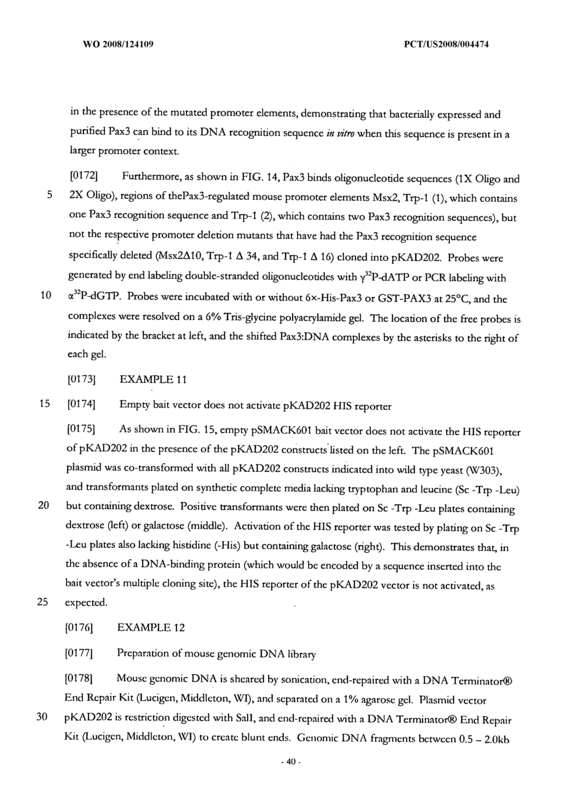 The method of claim 2, wherein the reporter gene and test nucleic acid sequence are located on a first plasmid. 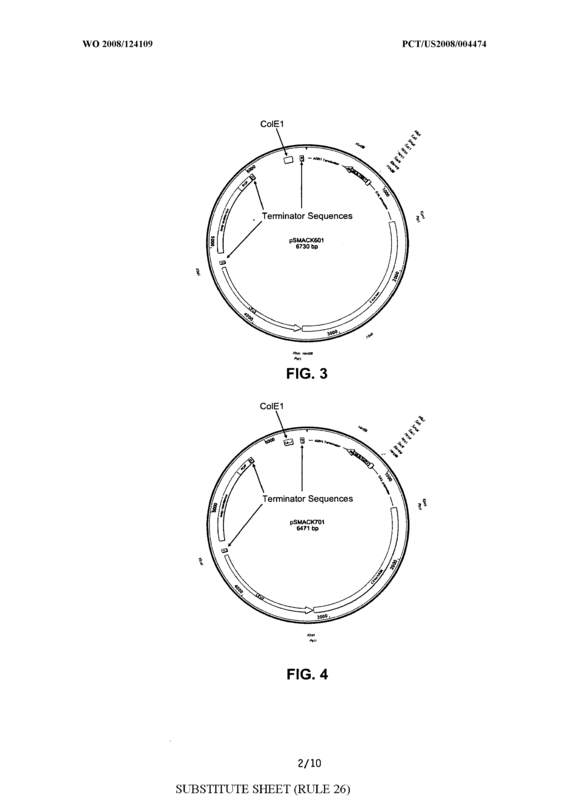 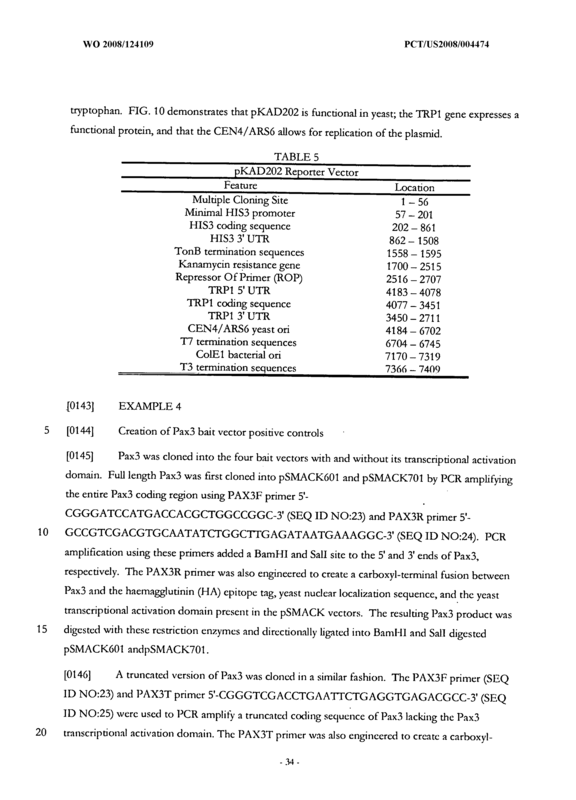 The method of claim 6, wherein the first plasmid is a low copy number plasmid. 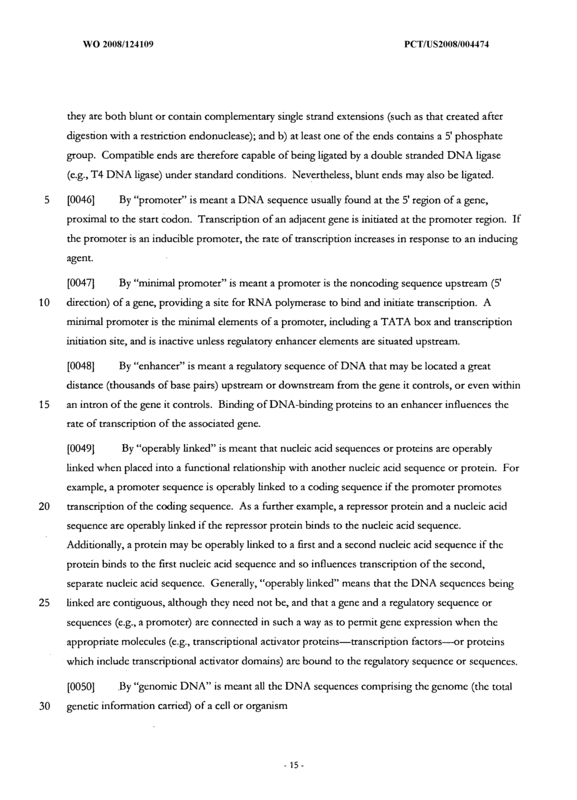 The method of claim 7, wherein die first plasmid comprises one or more transcription terminators upstream of the test nucleic acid sequence and one or more transcription terminators downstream of the reporter gene, and wherein the first plasmid further comprises a first selectable marker. 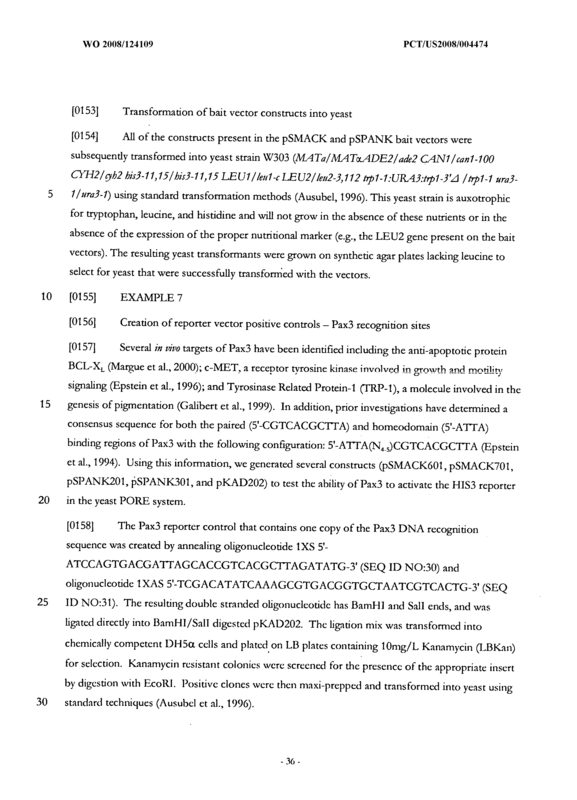 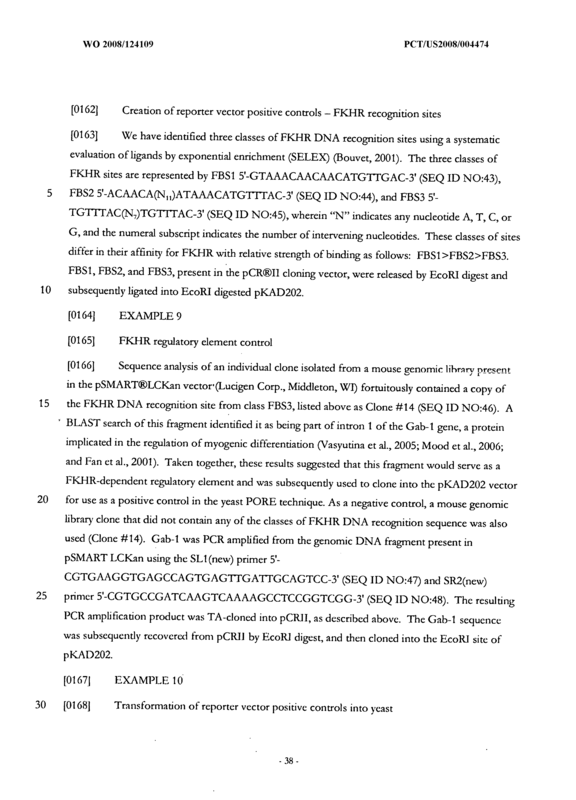 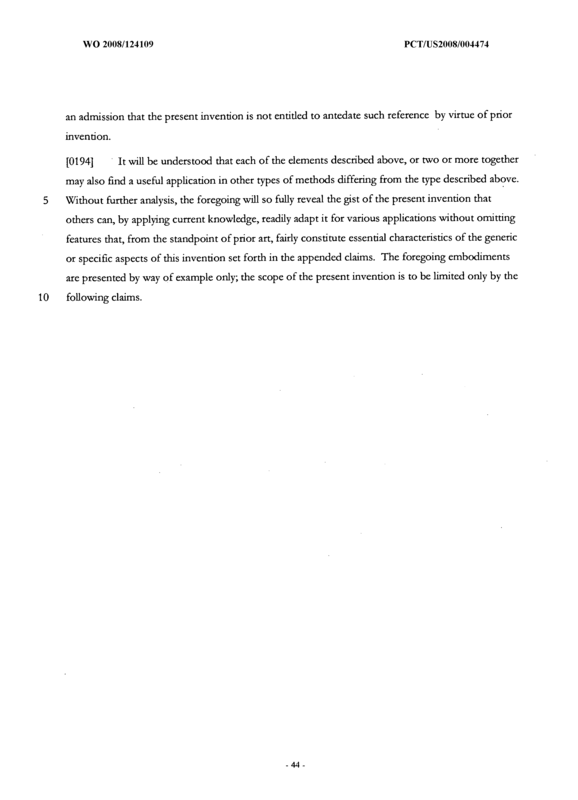 The method of claim 8, wherein the first plasmid is pKAD202. 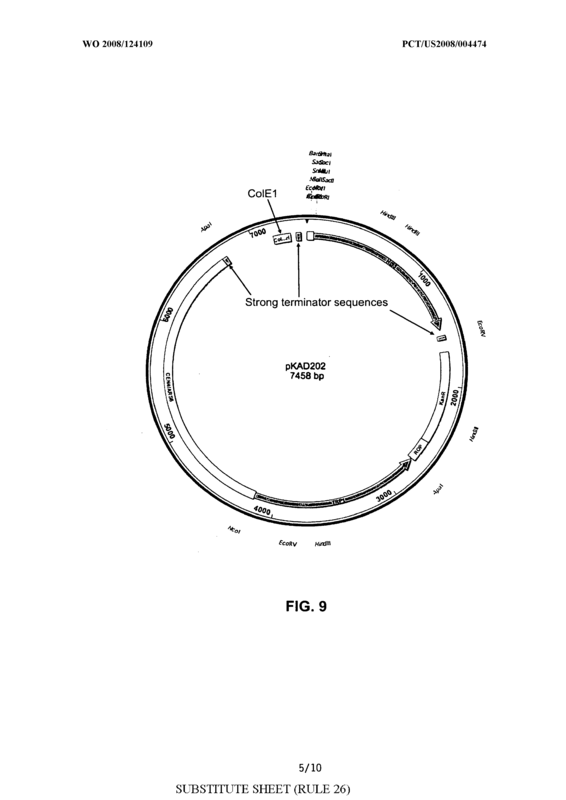 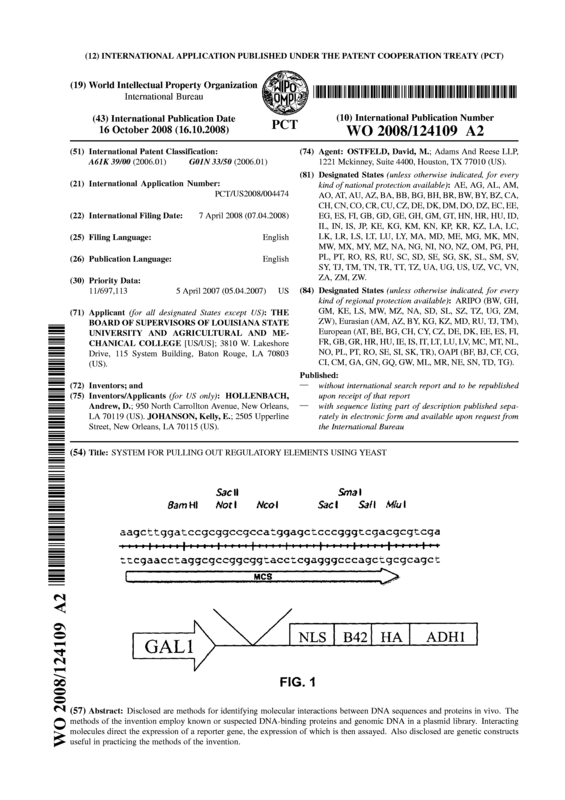 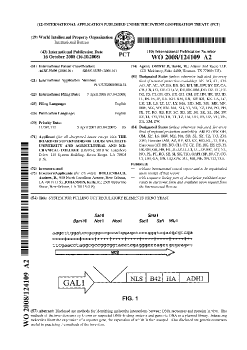 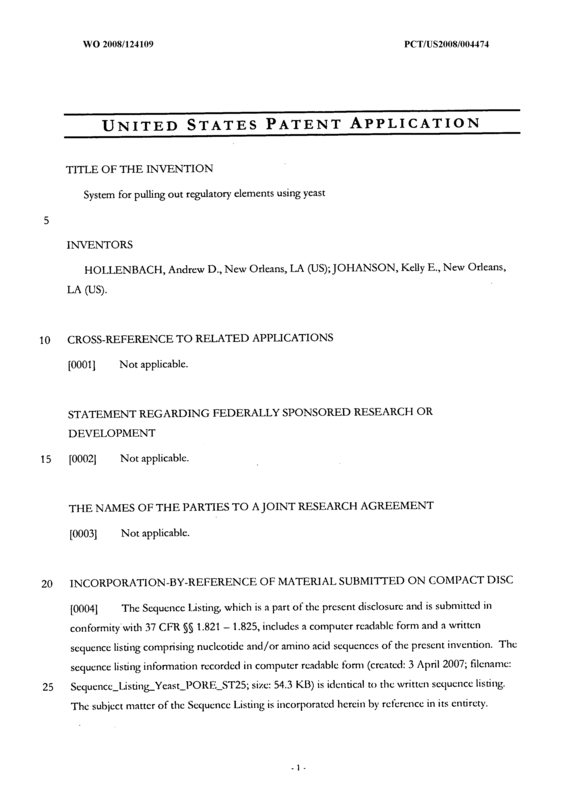 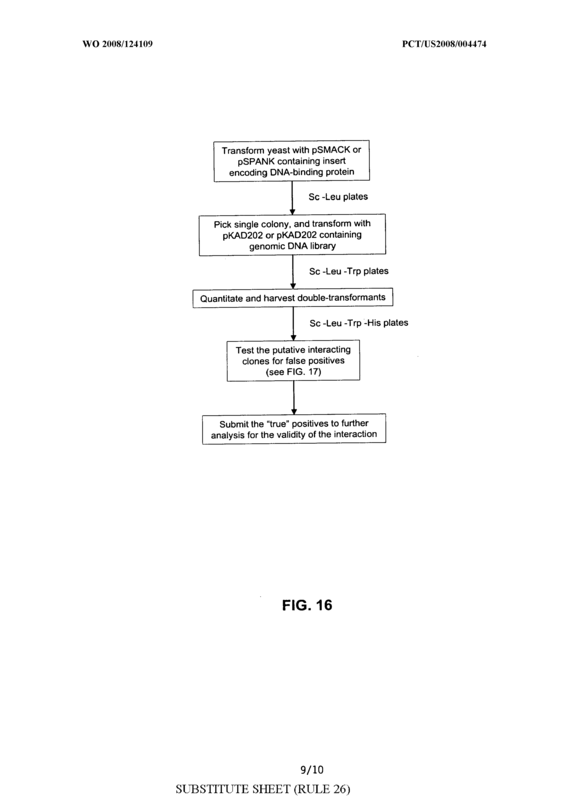 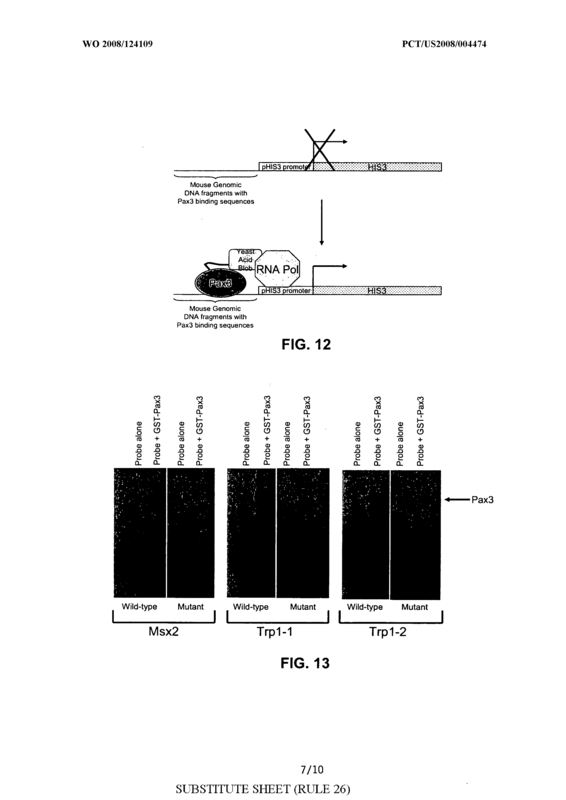 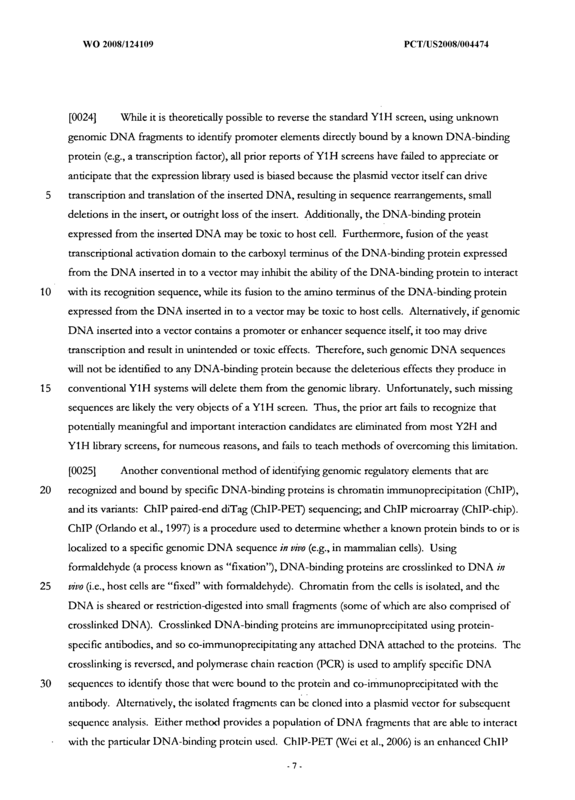 The method of claim 10, wherein the second plasmid comprises an ADHl terminator and a terminator selected from the group consisting of T3 terminator, T7 terminator, and TonB terminator, downstream of the fusion gene, and wherein the plasmid further comprises a second selectable marker, wherein the second selectable marker is not the same as the first selectable marker. 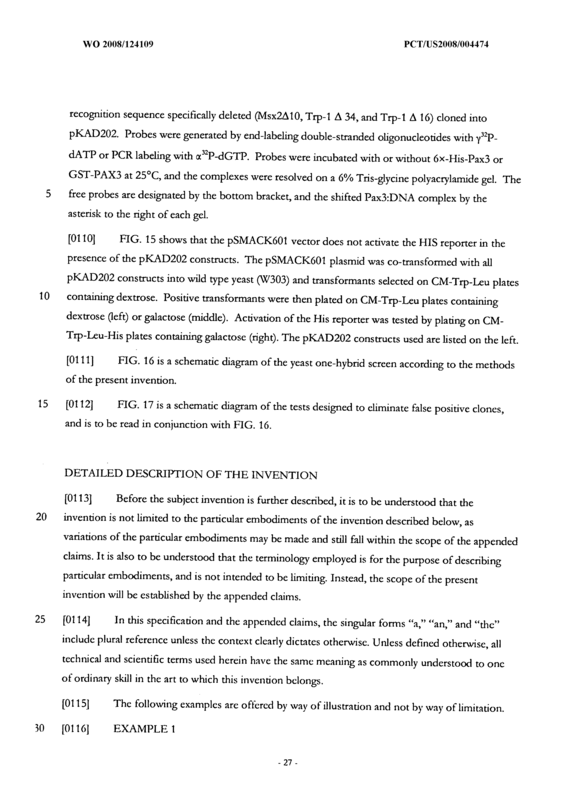 The method of claim 11, wherein the second plasmid is a low copy number plasmid. 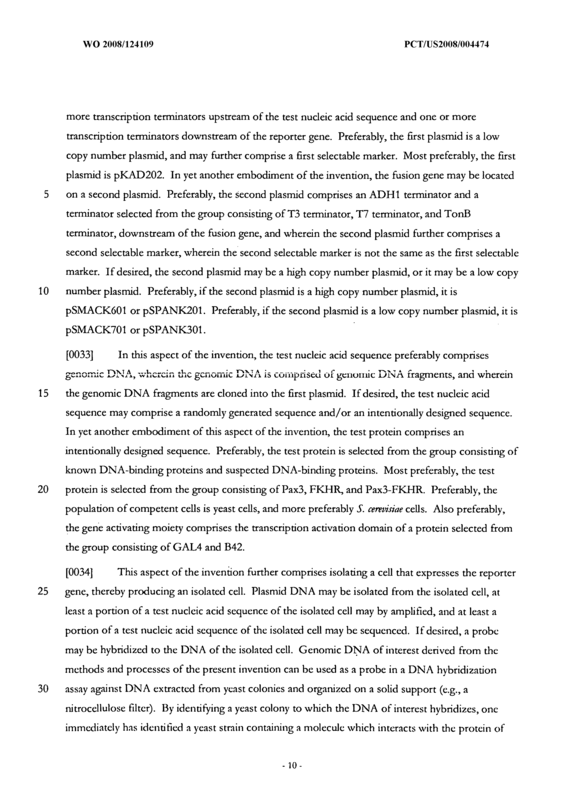 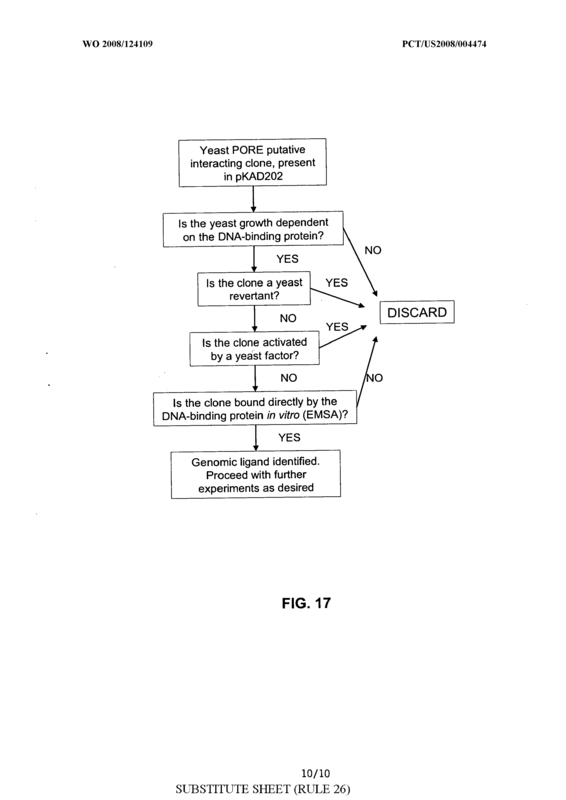 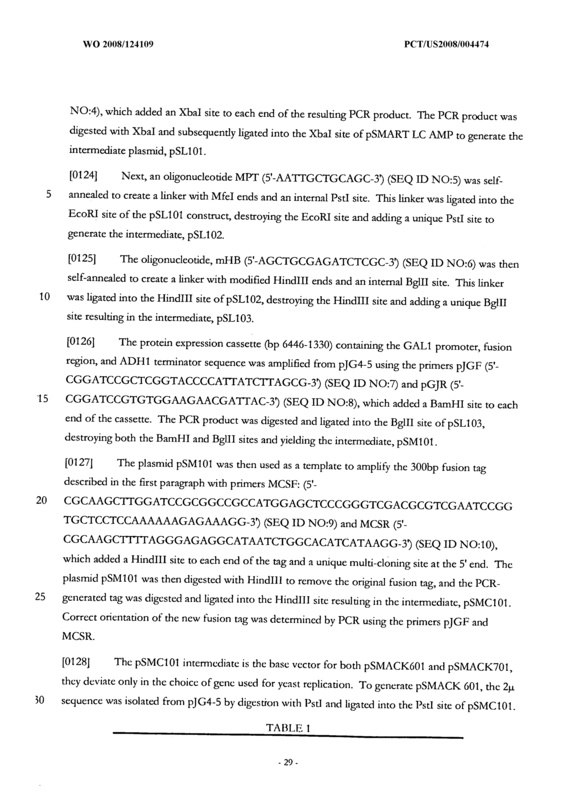 The method of claim 12, wherein the second plasmid is pSMACK701 or pSPANK301. 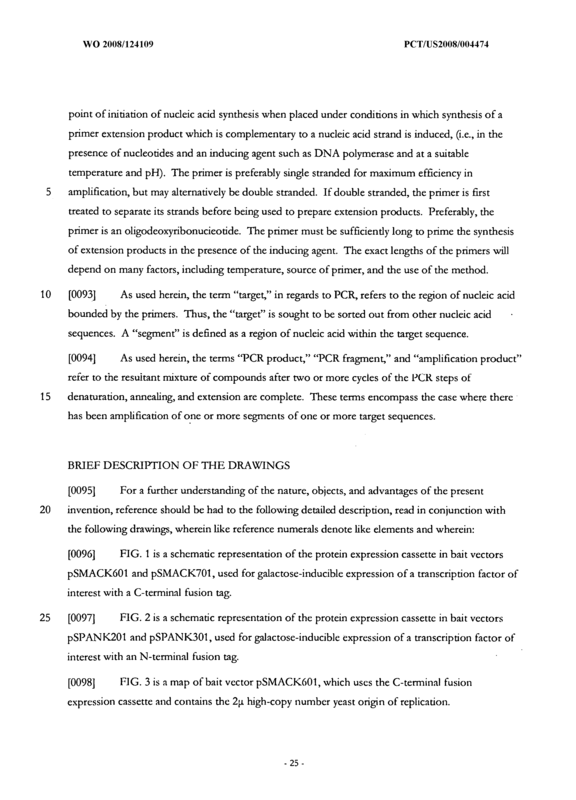 The method of claim 11, wherein the second plasmid is a high copy number plasmid. 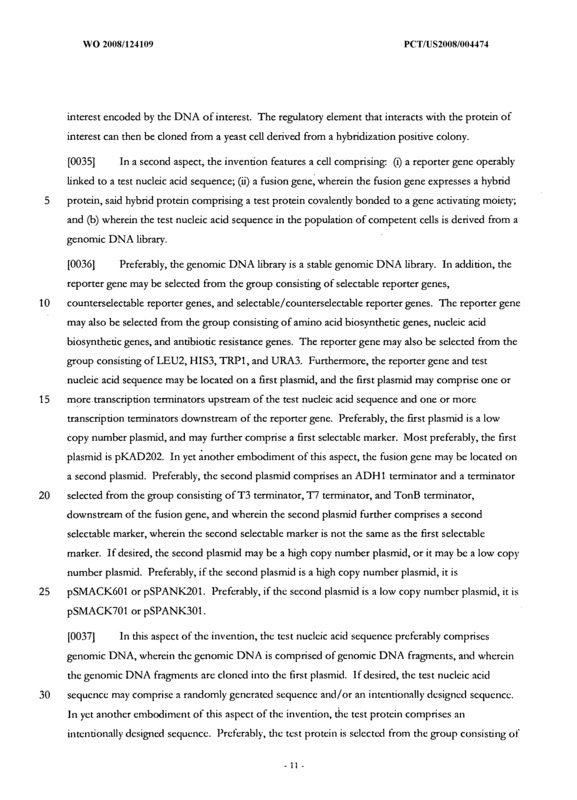 The method of claim 14, wherein the second plasmid is pSMACKόOl or pSPANK201. 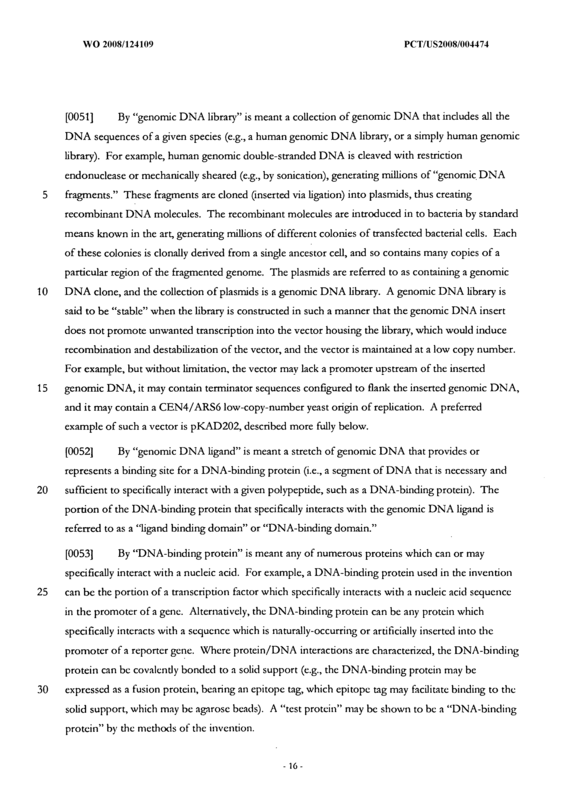 The method of claim 2, wherein the test nucleic acid sequence comprises genomic DNA. 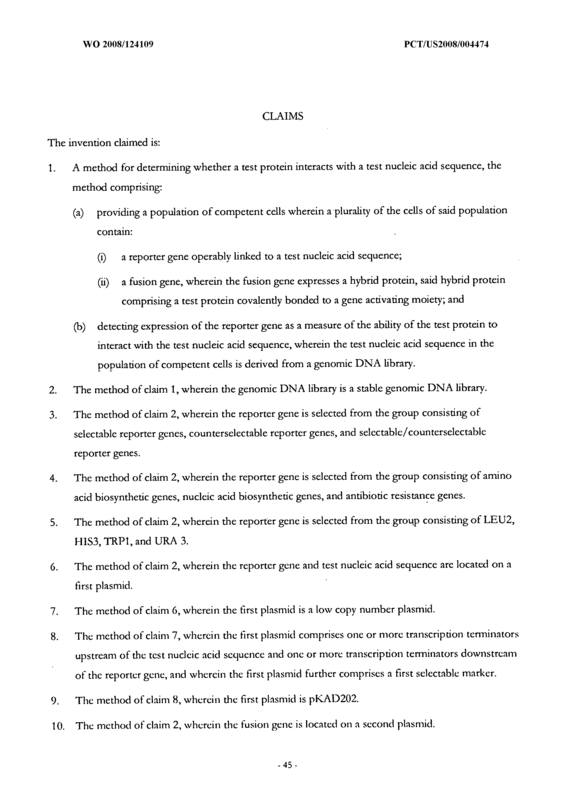 The method of claim 2, wherein the test nucleic acid sequence comprises a randomly generated sequence. 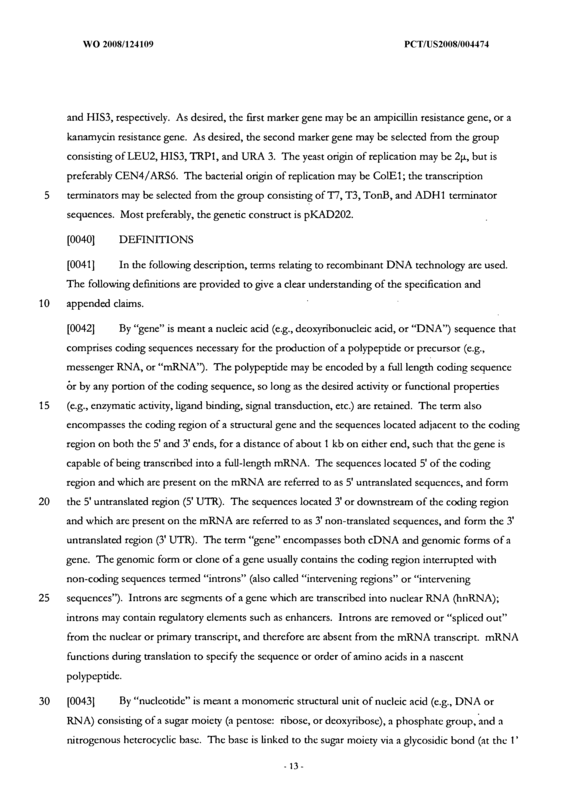 The method of claim 2, wherein the test nucleic acid sequence comprises an intentionally designed sequence. 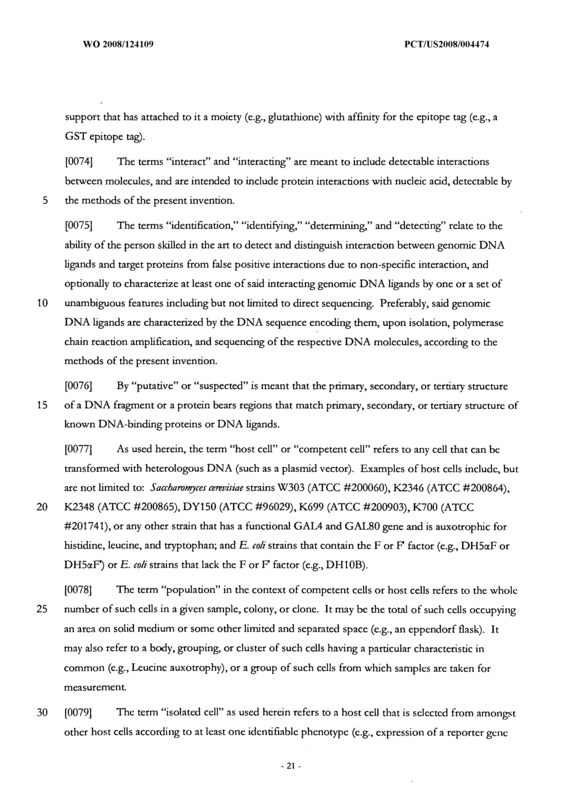 The method of claim 2, wherein the test protein comprises an intentionally designed sequence. 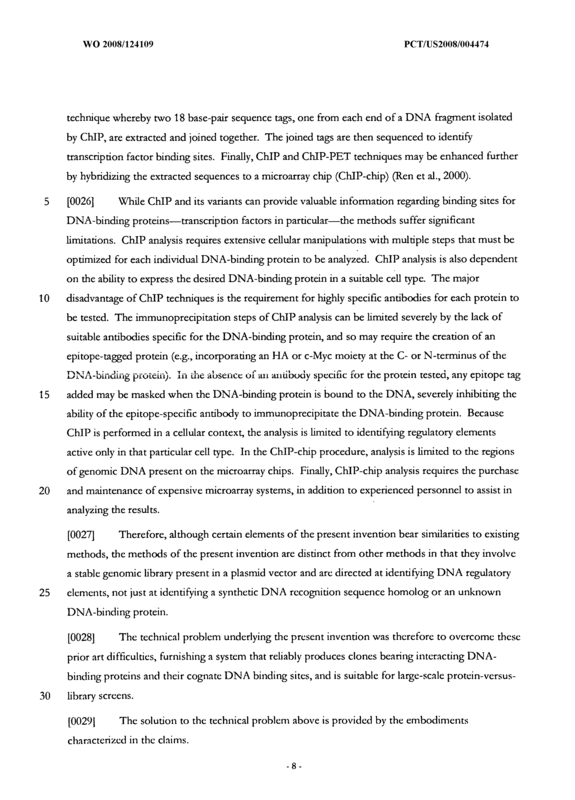 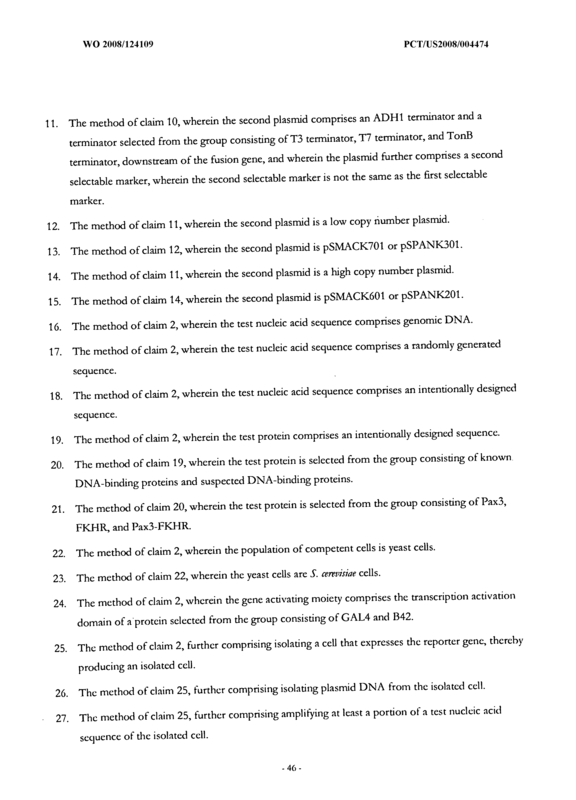 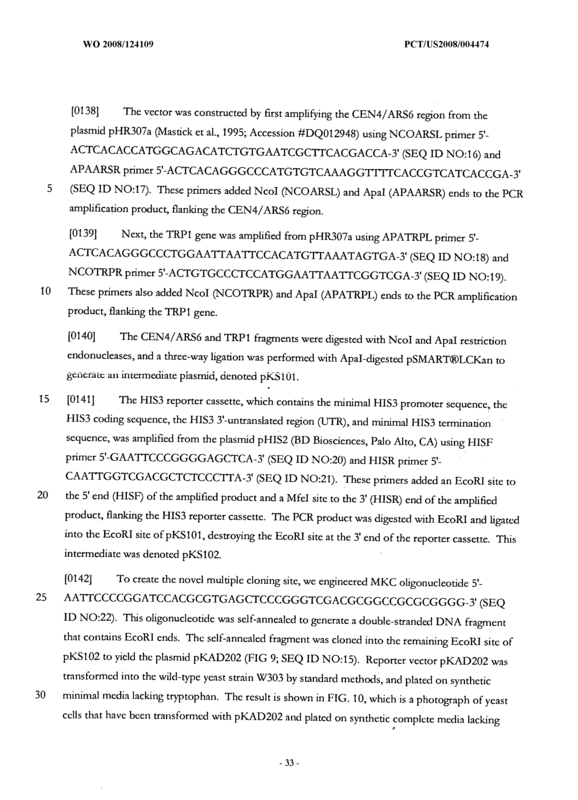 The method of claim 19, wherein the test protein is selected from the group consisting of known DNA-binding proteins and suspected DNA-binding proteins. 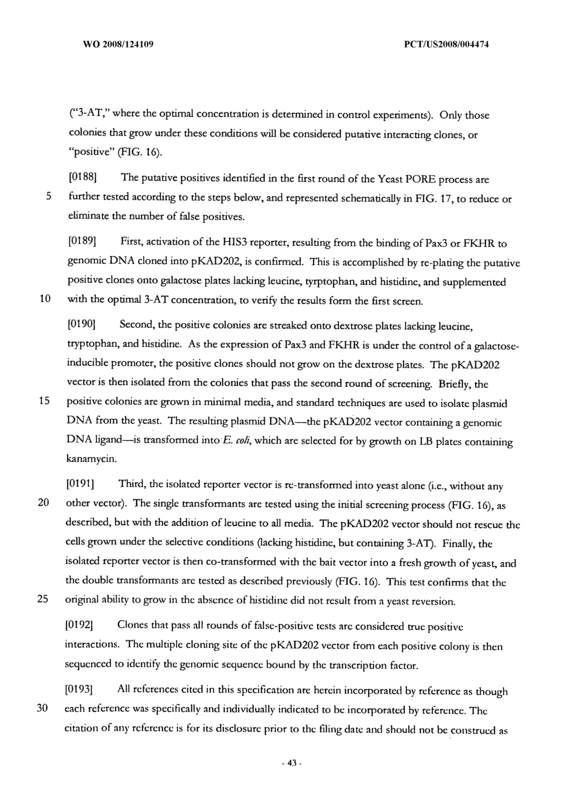 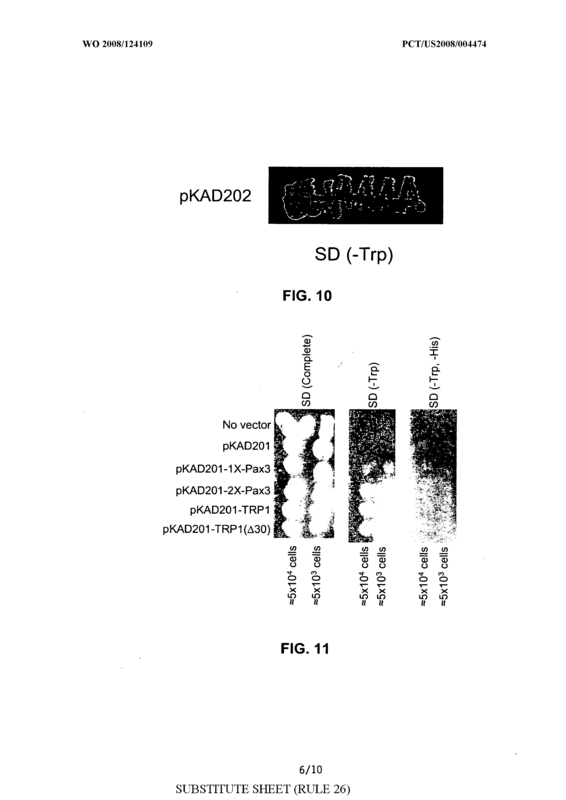 The method of claim 20, wherein the test protein is selected from the group consisting of Pax3, FKHR, and Pax3-FKHR. 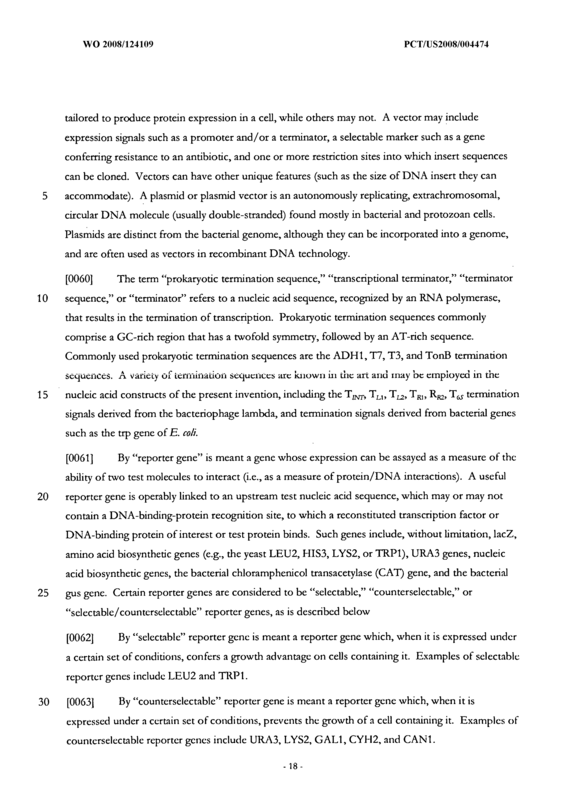 The method of claim 2, wherein the population of competent cells is yeast cells. 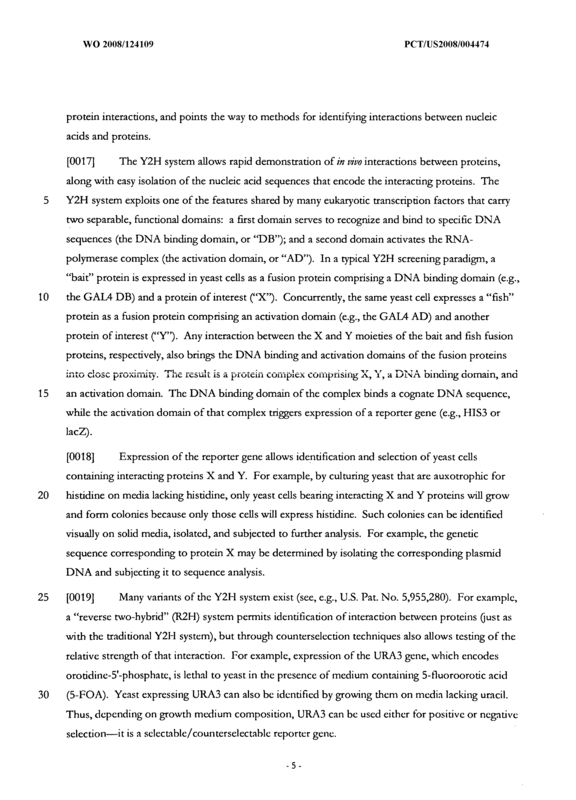 The method of claim 22, wherein the yeast cells are S. cerevisiae cells. 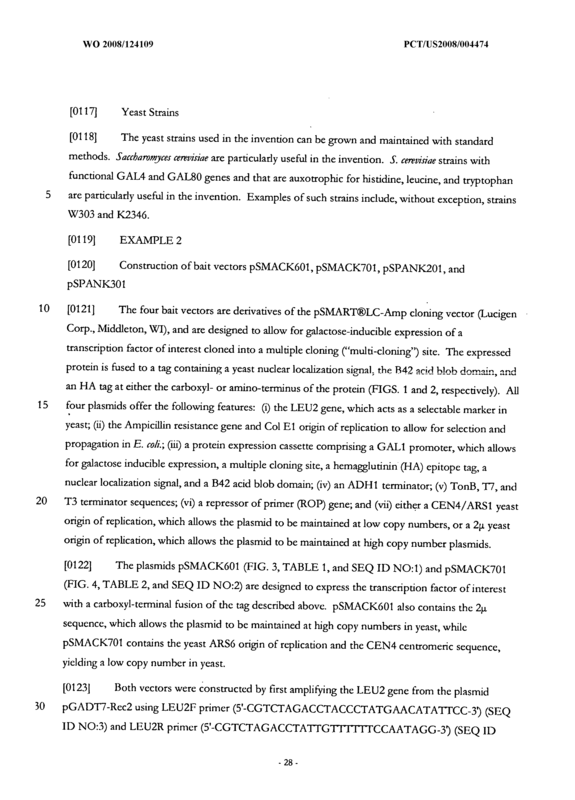 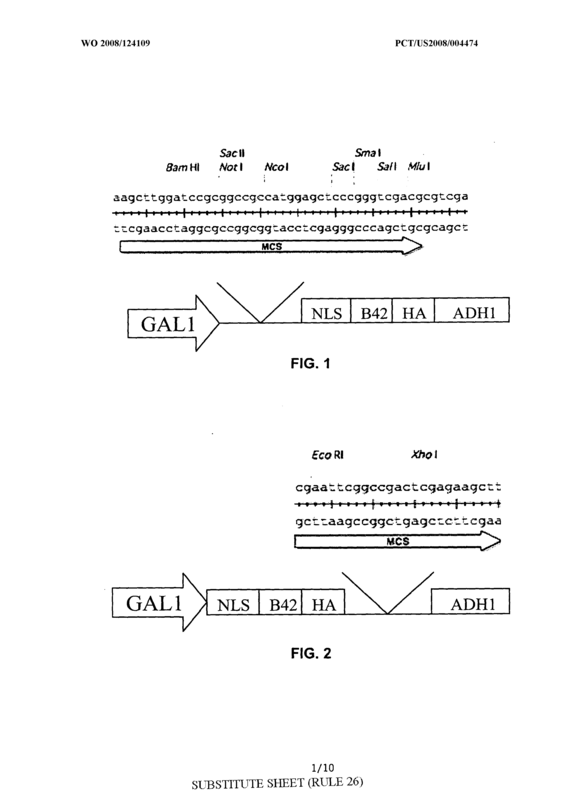 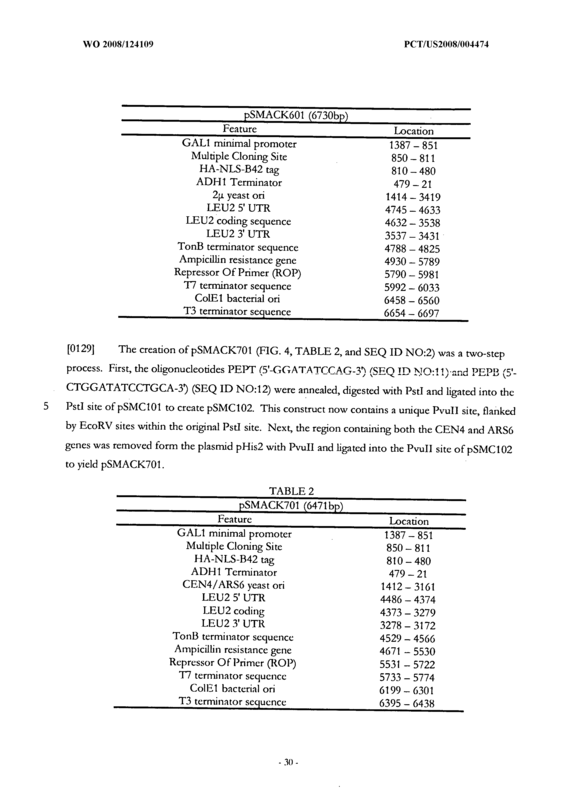 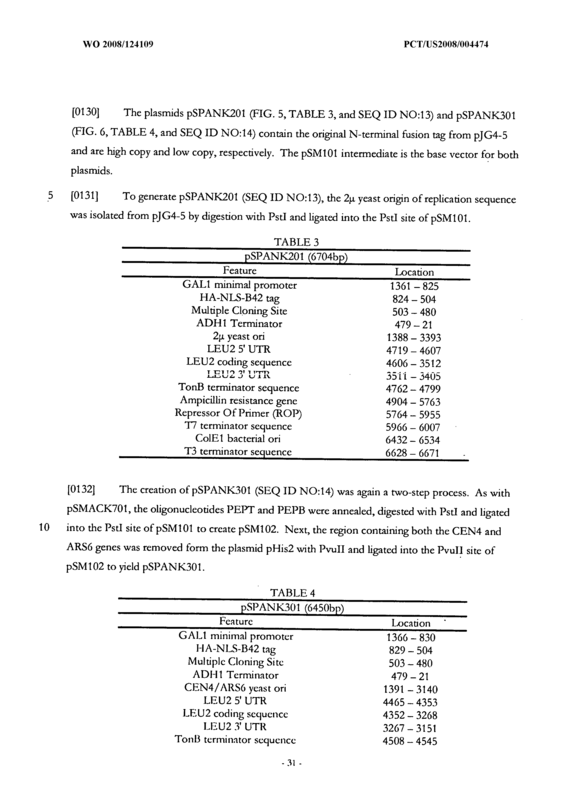 The method of claim 2, wherein the gene activating moiety comprises the transcription activation domain of a protein selected from the group consisting of GAL4 and B42. 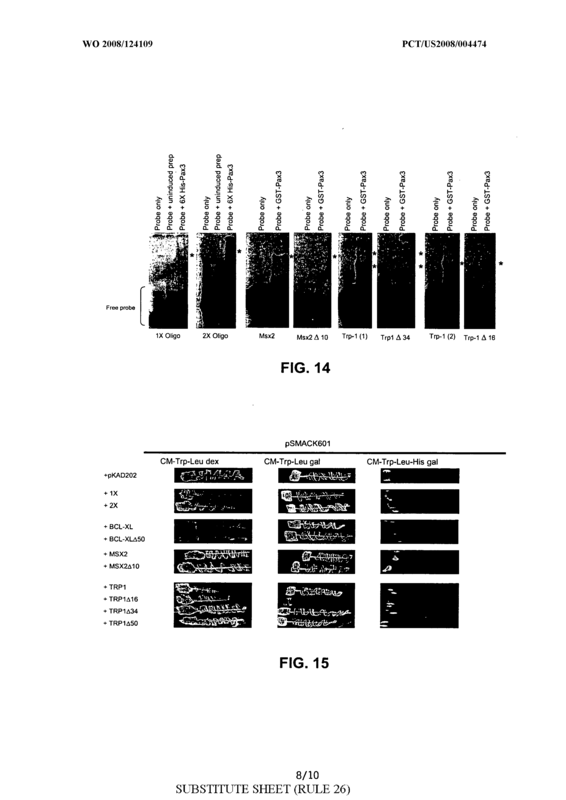 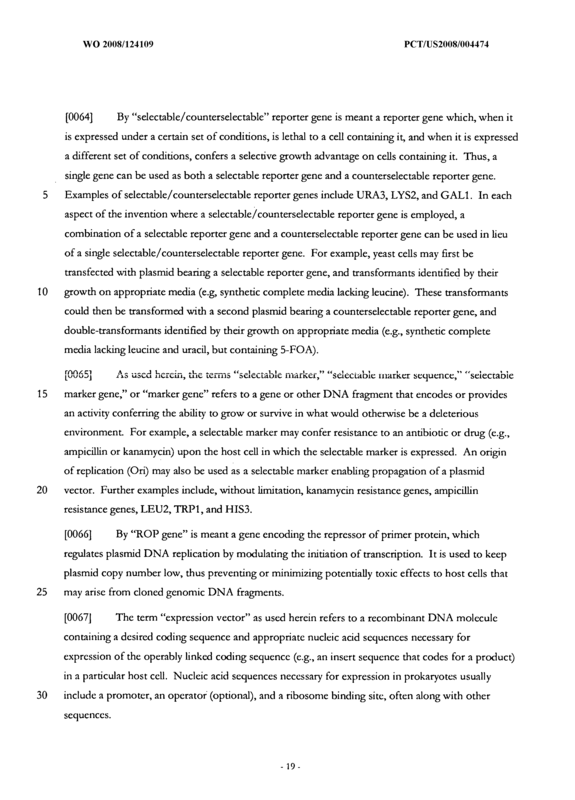 The method of claim 2, further comprising isolating a cell that expresses the reporter gene, thereby producing an isolated cell. 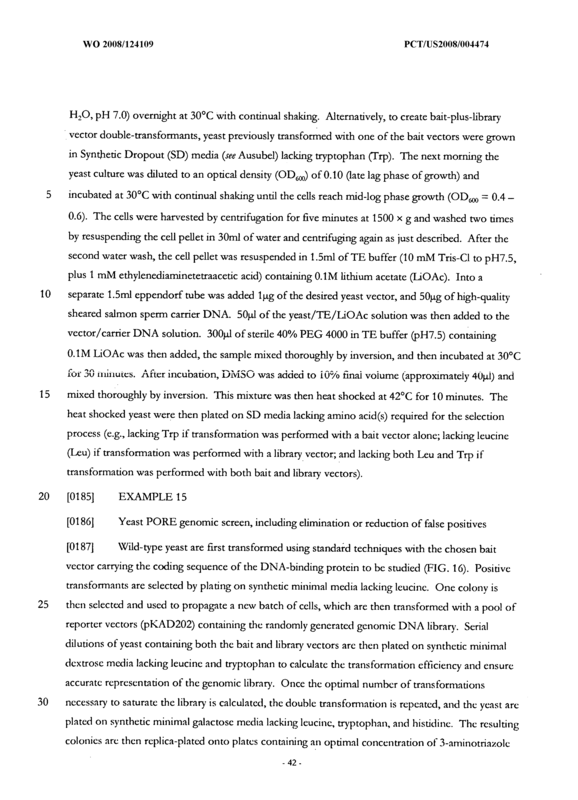 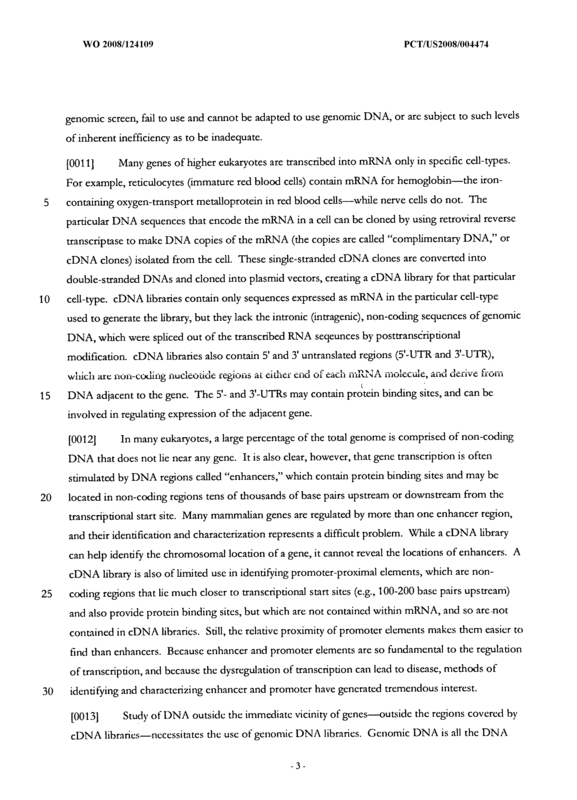 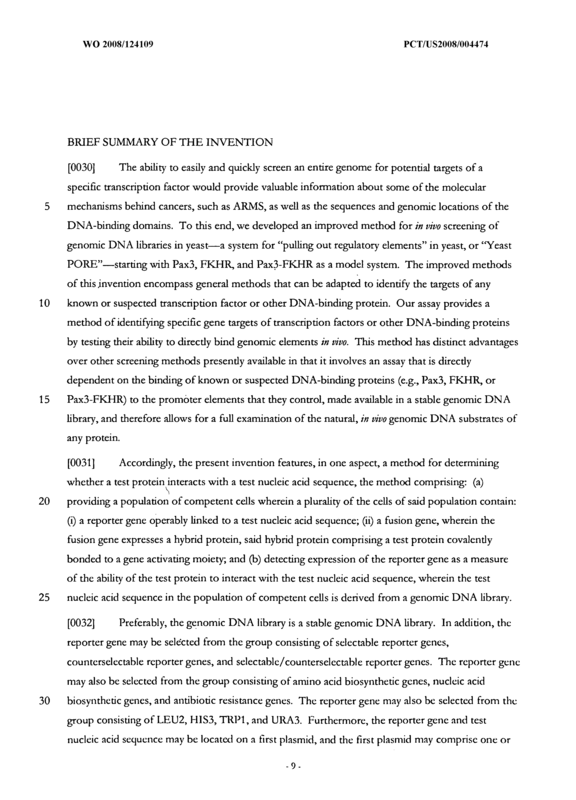 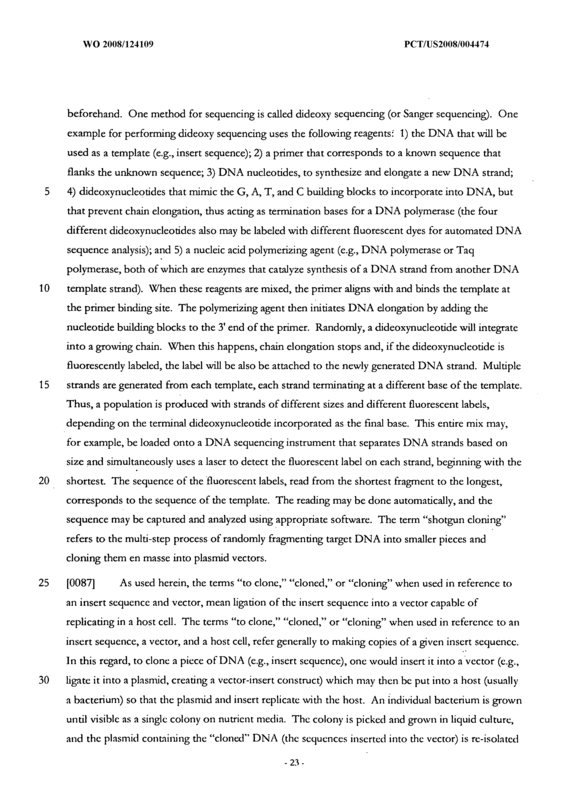 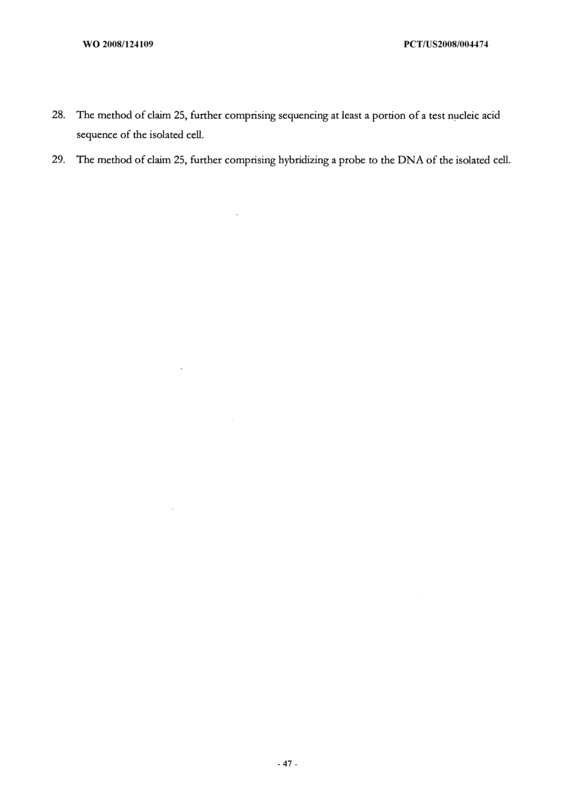 The method of claim 25, further comprising isolating plasmid DNA from the isolated cell. 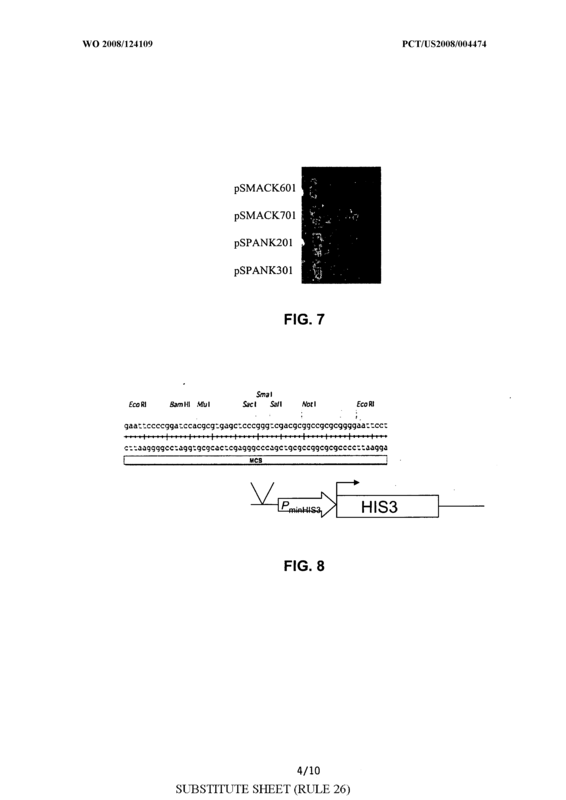 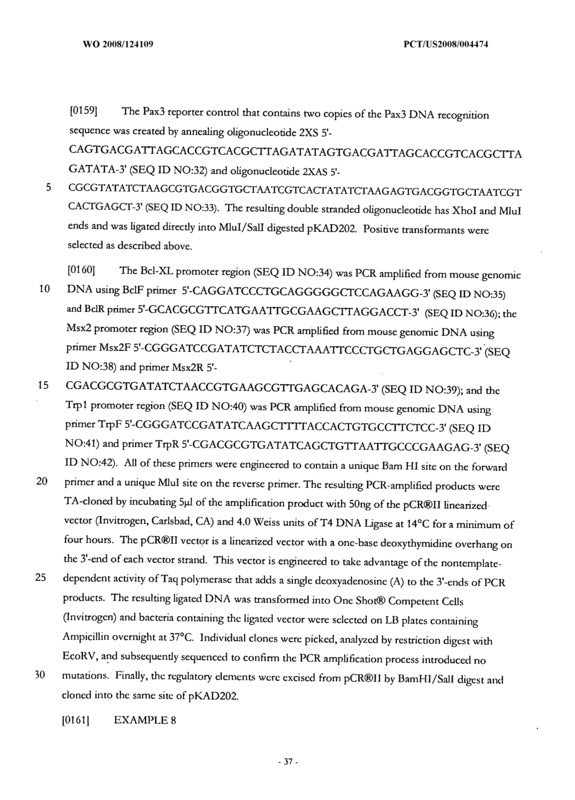 The method of claim 25, further comprising amplifying at least a portion of a test nucleic acid sequence of die isolated cell. 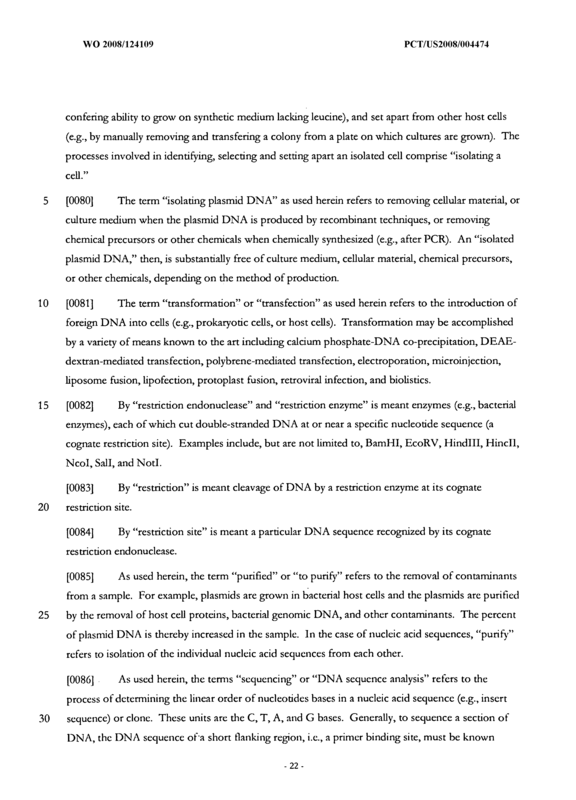 The method of claim 25, further comprising sequencing at least a portion of a test nucleic acid sequence of the isolated cell. 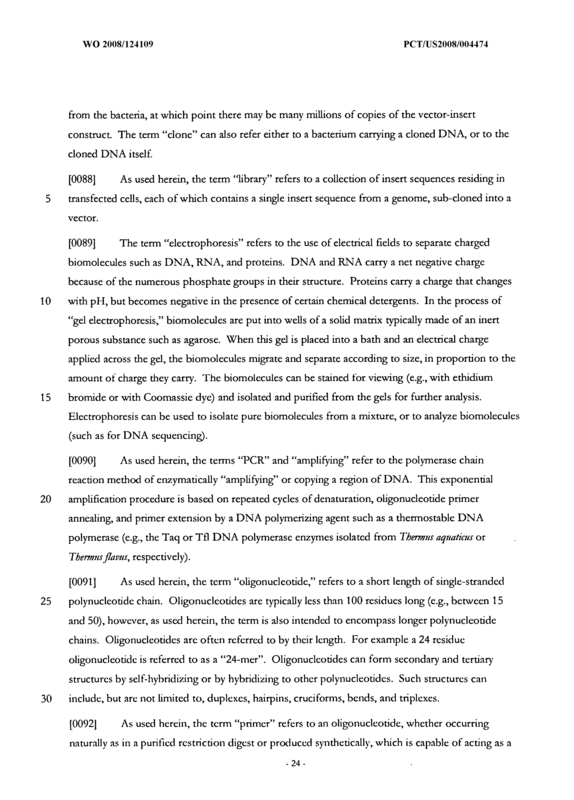 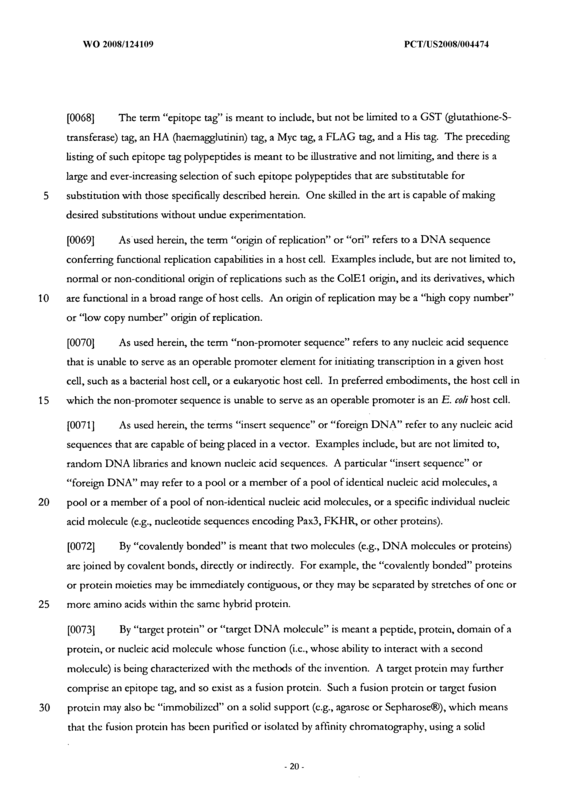 The method of claim 25, further comprising hybridizing a probe to the DNA of the isolated cell.